At its peak, the British Empire covered territories around the whole world on almost every continent from Africa to Asia to Australia. I’m sure most of us know and have been to countries that made up this empire. However, at its core were illustrious cities like Bombay, Hong Kong, Cape Town and New Delhi, which provided the industry, commerce, and wealth that enriched the mother country of Britain greatly and allowed the empire to be sustained. Ten Cities That Made an Empire is a fascinating look into 10 of these cities that tell the story of the empire’s development. In addition to those mentioned above, Boston, Calcutta, Melbourne, Dublin, Bridgetown, and Liverpool (the lone British city on the list) also feature. Boston, of course, stopped being part of the empire once the United States won its independence. An argument could be made for Singapore, Sydney or Kingston to be included, but otherwise the list is very sound. Bridgetown, as the capital of tiny Barbados in the Caribbean, might raise eyebrows, but having been colonized since the 17th century, it played a great role in the sugar industry in the British Caribbean, acting as a lively and prosperous shipping hub. With three cities, India features prominently which is appropriate given its nickname as the “Jewel of the Empire.” While Bombay, now Mumbai, and Calcutta (Kolkatta) were built by the British, Delhi was a historic city that had been the capital of the Mughal Empire. The British built a new section adjacent to Delhi, aptly naming it New Delhi as its grand seat of power, a role which it still fulfills today. Cape Town in South Africa was taken from the Dutch and not surprisingly, soon became an important refuelling station for British ships rounding the Cape of Good Hope heading to the East. Hong Kong was seized as a prize of war from China’s ruling Qing Dynasty after victory in the Opium War, and hence saw its fortunes transformed from a mere fishing village to a free market business hub that it still is now. The author, who has written several books and was a former Labour MP who is now the head of the Victoria and Albert museum, does very well bringing each city to life, showcasing fascinating historical facts and developments concerning architecture, politics, and economics. I admit I am very biased because I do enjoy cities very much, whether visiting or reading about them. Of course, there is always controversy and debate about the empire, regarding how much harm it inflicted on colonial subjects and the actual benefits that were derived from the British rule. Hunt does not vilify the empire or glorify it, though he shows how imperial officials often thought they were doing great work. The chapters proceed in loose chronological order, and in so doing, illustrate the changing fortunes and status of the British Empire. We see how the empire develops and expands from an Atlantic slave-based power to an eastward-looking empire centered on its prized possession of India. The irony is that by starting off with Boston, the author begins with the British loss of America in the late 18th century, but instead of wilting, they went on to greater things by conquering the world. And in ending with Liverpool and its decay and slight resurgence in the 20th century, we see the empire and its power finally ending as Britain comes to term with a new era and world. 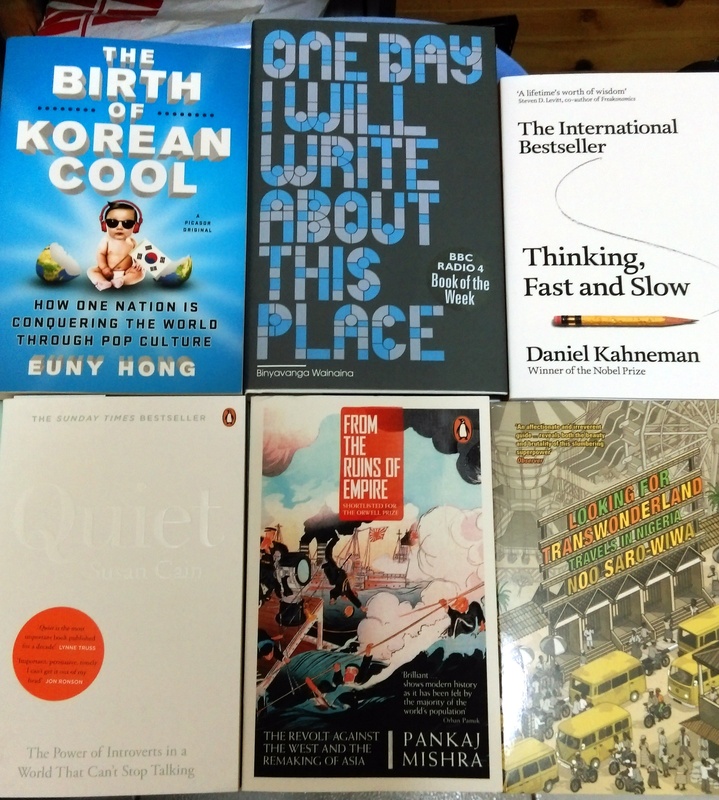 Ahead of my recent trip to Taiwan, I ordered 6 books from Book Depository so I will have some good reading in the upcoming weeks. I finished the first one in about a week. Binyavanga Wainaina’s One Day I’ll Write About This Place is a entrancing memoir about the writer, his country Kenya, and by extension his continent Africa. Wainaina is famous for his 2005 Granta article about how to write about Africans, a sarcastic commentary and critique of how Westerners often portray Africa. There is some of that in this memoir, though Wainaina’s criticism is often directed at his country. Wainaina’s book is several things – a collection of vignettes of his life, a wry take on his youth and university years in South Africa, a touching remembrance of his parents, especially his mother, and a lively and at times frustrated narrative about Kenya. The book starts with Wainaina’s middle-class childhood, then moves to his wayward university years in Umtata (Nelson Mandela’s hometown), South Africa, during which he dropped out and spent a year not really doing much, and his years of struggle before his writing career starts forming. He does not fully explain what ails him, though perhaps there may have some depression. There’s an interesting chapter about a trip to Togo to write about the country for the 2006 World Cup; Togo is little known to many people other than its most famous footballer, Spurs and ex-Arsenal striker Emmanuel Adebayor. Wainaina holds little back in his thoughts and his recollection of his life. There’s little idealism or romanticism about his observations, just a sense of blunt realism that takes in the good and bad, the joyful and the bitter, whether it is about his life or about his country. His chapter about going to Uganda for a grand family reunion at his maternal grandparents’ home is great, as is his touching tribute to his mother after she dies of cancer. It is a superb book about life in Africa from an African, specifically a Kenyan who has links to all over the continent. Wainaina goes through some rough times, does not quite reach despair, at least not until the end. The last chapters see Wainaina describe a Kenya festering with tension and descending further into tribal-based paranoia and hate, until finally tribal violence breaks out after elections at the end of 2007. Wainaina then leaves for the US to teach and write, somewhat broken. He later returns to his country in 2010. This is not a book filled with lessons or colorful cliches. Instead, it is one that will help you appreciate one of Africa’s better Anglophone writers, and understand Kenya and Africa a little better.